Danny Klecko is the CEO of the Saint Agnes Baking Company in Saint Paul and the author of the MHS Press book, K-9 Nation Biscuit Book. 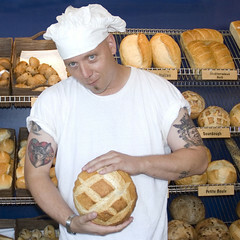 He is currently hosting twelve days of food demos at the Minnesota State Fair, in the Creative Activities building. If you would like to hear more stories from him, check out his popular blog site The Last American Baker. 1. What is a typical weekend for you? When you service hotels, restaurants, and casinos there is no such thing as a typical weekend. Saturdays are interesting because I can find myself running products to my farmer’s market booth or bringing baked goods to one of our accounts that may have forgotten to order. To me it has never seemed like work. I love the energy that surrounds the Twin Cities food scene. If I am lucky enough to get the weekend off, you’ll find me on a baseball diamond teaching kids how to hit baseballs. Saint Paul has produced legends like Mauer, Molitor, Morris, and Winfield, but I had a group of kids this summer that might give these legends a run for their money. 2. What are some of your favorite local Friday night activities? On Friday evenings I like to attend all types of events. I don’t care if it’s an intimate show at Patrick’s Cabaret or something bigger, like a Timberwolves game. Oftentimes I find myself not even watching the entertainment because I become more intrigued by how these venues light their spaces or how they control their traffic flow. 3. What/where do you eat on weekends? What’s a typical Sunday breakfast for you? When you service 300 commercial accounts, you have to be careful when you give a personal endorsement. To put one restaurant on a pedestal means you might upset the other 299 concepts. With that being said, I’m going to go out on a limb and be honest with you. When my family goes out together, we always do breakfast. If you live in or around the Highland Park area, is there any other choice than the Copper Dome? I’ve lived in this neighborhood for 20 years and I swear to Caesar their staff hasn’t turned over a single employee in decades. However, if I am by myself, I go to the Day by Day Cafe. Overall I would say they offer the most complete breakfast for sophisticated guys like me. 4. What’s your weekend reading like? During the weekends, if I want to indulge myself, I’ll usually mix myself a Rusty Nail and read poetry. During the winter months I will either review the classics like Carl Sandburg, Ezra Pound, or Saint Paul’s own Poet Laureate Carol Conolly. When my son comes home from college in the summer we read nothing but poems from Russia and Poland. 5. 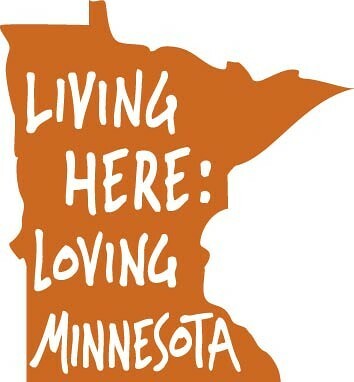 What is your top Minnesota getaway? The thing I enjoy most about Minnesota is there are more getaway options than I have time for. But, if I want to go someplace special, someplace that offers intrigue or romance, I’m heading north to Duluth. My wife is more adventurous and likes to go to spots that we are unfamiliar with. In fact just a couple of weeks ago she made me go to Luverne. If you check out my Facebook page, you’ll see her standing next to a scale-sized plastic buffalo. 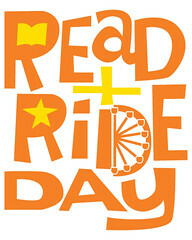 Celebrate Read & Ride Day with your public library in Carousel Park tomorrow, Wednesday August 29th, at the Minnesota State Fair. You’ll find stage shows all day long and fun activities for the family under the tent. Meet up with fellow library lovers at noon in Carousel Park for the Library Card Mob! Make & Send State Fair Postcards: Share your 2012 State Fair experience with someone special on a postcard you design yourself. If you have the address we’ll mail it for you from the Fair, or take it with you to mail later. Game On! : Test your knowledge at the Spin & Win Trivia Wheel. Test your luck at Library Plinko! Everyone’s a winner on Read & Ride Day! Get Carded! : Stop by the Read & Ride Day tent to show us your library card and get your “I Got Carded” button to wear with pride during your day at the Fair. Get Your Words Here: Need help with your Fabulous Fair Alphabet game card? Your public library has the words to help you complete it. If you have not stopped by the Alphabet Forest (in Baldwin Park), you can pick up your game card here and get started. We’ll also provide directions to the Alphabet Forest where you receive your blue ribbon. Read & Walk—Minnesota’s Hidden Alphabet: Read a book while you walk across Carousel Park! Enjoy Minnesota’s Hidden Alphabet, with photos by Joe Rossi and words by David LaRochelle as you make your way between the Grandstand to Carnes Ave.
An occasional series highlighting local authors and their favorite ways to spend a Minnesota weekend. Weekend? What? For most writers I know, when things are going well with a new book, the weekend is a great annoyance. Just one more distraction perpetrated by the real world (Thomas Mann also said this of the telegraph). But there’s a fine line between being in a writing groove and being a crabby stick-in-the mud husband or friend. Therefore, even if my writing is going never-better I try to take at least Sunday off and be cheerful and available even though my fabulous wife and fine friends know I’m faking it. And, if I have been suitably present and a good companion throughout a weekend, I often get back to my computer Sunday evening and position myself to start writing first thing Monday. 2. What are some of your favorite local Friday-night activities? My small city of Bemidji has a limited number of good restaurants, so I get to know their menus well. I eat less meat these days not from ideological but more for digestive reasons (six ounces is a great plenty). I eat a fair amount of local fish, some of which I catch in the Mississippi River, which passes by my house (the Upper Mississippi, only twenty miles from the headwaters, and where the water is clear and clean). Sunday breakfast? Usually later and bigger, often with my wife’s made-from-scratch pancakes, bacon (rationed to once a week by my cheerful young physician), and maple syrup or jelly I’ve come by from friends or family. Usually the newspapers and the New Yorker which I’ve gotten behind on during the week. I seldom read books when I’m writing one, and since I’m usually writing one . . . . Well, you see the irony here. Duluth is always great, especially for the Bayfront Blues Festival in August, though I also greatly enjoy the bluff country around Red Wing. Will Weaver is the author of four MHS Press books–Barns of Minnesota; Sweet Land; Red Earth, White Earth; The Last Hunter–and a contributor to the anthology Libraries of Minnesota. Will’s newest novel for young adults is The Survivors, a sequel to Memory Boy. To learn more about all his work for adults and young adults, visit willweaverbooks.com. Tonight’s feature at the Indigenous Movies and Music in the Park series at Father Hennepin Bluffs Park in downtown Minneapolis is a screening at dusk of the film Dakota 38. Music from Maza Kute, a traditional singing group from the Santee Reservation in Nebraska, with the Mankato Symphony Orchestra begins at 7:00 p.m. Arrive early to check out the food and produce market stand from Dream of Wild Health. Delicious traditional foods and fresh-from-the-farm produce will be available for purchase. Dream of Wild Health is a ten-acre organic farm in Hugo that connects Native people with indigenous foods and medicines. The farm’s executive director is Diane Wilson, author of Spirit Car and Beloved Child. Spirit Car is this year’s One Minneapolis One Read selection. Minneapolis American Indian Center (1530 E. Franklin Avenue). 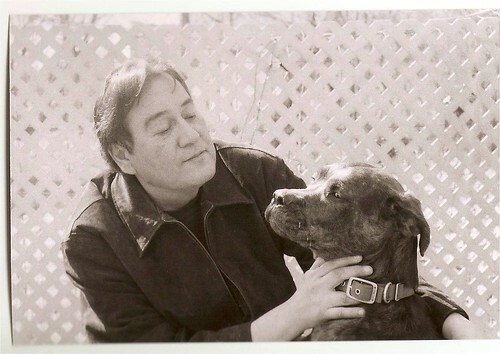 Author and playwright Mark Anthony Rolo will share his new book My Mother is Now Earth and present a reading of his new play Buckskin for a Bride. An isolated northern farm provides the backdrop to a child’s searching, empathetic view of his conflicted mother during the last three years of her life. While planning her wedding to the man of her dreams Lucy Deer’s bright future is threatened when her long lost American Indian reservation family appears on the doorstep of her Manhattan apartment. Lucy’s older sister and her activist boyfriend along with their side-kick mother have come to the city seeking amnesty after participating in a failed tribal government coup. Determined to save her “happily ever after” fantasy Lucy sets into motion a screwball smoke and mirrors scheme to resolve her renegade family’s legal troubles while keeping her fiancé in the dark. But what she does not know is that even white men like her bridegroom have their own secrets to keep. Mark Anthony Rolo is an enrolled member of the Bad River Band of Lake Superior Chippewa. He is the former editor of The Circle newspaper and Washington D.C. Bureau Chief for Indian Country Today. Mark Anthony served as host and co-writer of the PBS film on Native Americans living in Los Angeles A Seat at the Drum (2006). A collection of his plays, What’s an Indian Woman to Do? and Other Plays, was published by UCLA American Indian Studies in 2010. Borealis Books, an imprint of the Minnesota Historical Society publishes works rooted in America’s heartland with universal and lasting appeal. Author of Lincoln and the Indians, David Nichols joined MPR host Cathy Wurzor on Tuesday morning. The topic of the morning show was the Dakota War of 1862, with Friday being the anniversary of the first battle of the war. 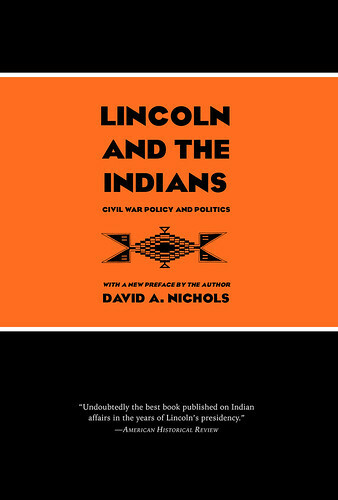 Specifically discussing Abraham Lincoln’s participation in the war, and discussing the government’s Indian policy, Nichols was brought on to shed more light on the subject. Together, Nichols and Wurznor talk about the war and that chapter in history. Friday is the 150th anniversary of the first battle of the 1862 U.S.-Dakota War. 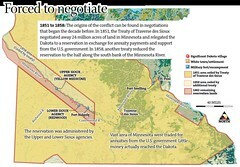 The Star Tribune offers “Mapping the Dakota War,” a timeline chronicling events leading up to the war, providing background information, and highlighting key locations and their relevance to modern-day Minnesota. Readers can learn about the war by scrolling through the timeline chronologically. Along with this collection of pictures and maps, the Star Tribune lists other sources of information, including Through Dakota Eyes: Narrative Accounts of the Minnesota Indian War of 1862. For yet another perspective, pick up Lincoln and the Indians by David A. Nichols. Online or in print, there are numerous ways to increase your understanding of these pivotal events in Minnesota’s history. We introduce the series with Ann Bauer, coauthor with Mitch Omer of our bestselling cookbook, Damn Good Food: 157 Recipes from Hell’s Kitchen. Ann and her husband and teenage daughter live in Highland Park, a neighborhood of St. Paul. Ann’s newest novel is The Forever Marriage. A typical weekend is quiet. For years, I got up at 6 a.m., 7 days a week, to write. But since our youngest went to college this year, I’m trying something new: allowing myself to sleep until 8 or even 9 on weekends. Waking up naturally feels decadent to me. My husband and I never speak in the morning, because I’ve found that’s the best way to work. He’ll often make me espresso and deliver it without a word. If the temperature is over 55 but under 85, we’ll go on a long motorcycle ride in the afternoon. We like eastern Minnesota for its hills and orchards. There are some sweet little restaurants along the St. Croix: Olive’s has the best salmon-dill pizza. Also La Cosinita in Bayport, WI. In winter, we do a lot of reading and hibernating. Sundays, we have a family dinner with our adult kids (the ones who are in town) and invite “extended” family—friends and neighbors. I’m big into one-pot cooking. We visited Budapest this year, so Hungarian goulash—with a salad and bread from Rustica—is my current favorite cold-weather meal. I spent two years as a food critic and, frankly, that burned me out on “hot” restaurants—especially on Friday nights. If a place is new and hyped up, if people are waiting to get in even with a reservation, I want no part of it. So our Friday evenings are really low key. It’s the end of the work week, so we might have a nicer-than-usual bottle of wine. If we go out, it’s to one of the small places we’ve loved forever, like the Sample Room or Mango Thai. We frequently go to Namaste on Hennepin; it’s so good and somehow there’s always room. Once a month, there’s a gathering of artists called Algonquin Hotdish—we’ve been going to that for years. I’m not much of a breakfast person—in the morning, that is. I love breakfast food, but I tend to eat it later in the day, once I’m done writing. What’s important to me on a Sunday morning is a great cup of coffee WITH REAL CREAM. I don’t want flavors or skim milk or some chromosomally altered sugar substitute. Cream, cinnamon, and maybe a touch of honey if the coffee is very dark and strong. My husband and I travel quite a bit, and when we’re on the road, accountable to no one, we eat a small meal at 10:30 and a large one around 3. Then we’ll get some wine and snacks for our hotel room: crackers and cheese or fruit. And once we stop for the night, we’ll have a very very light 8 o’clock dinner. But we have to be done riding for the day if we’re on the motorcycle. We never drink and get back on the bike. I read the same way on weekends that I do during the rest of the week—only more so. I may be the only Minnesota writer I know who does NOT have a Sunday ritual around the New York Times. I love the Times and I read it (online) frequently. But I’m not an avid newsprint-on-the-hands person. In fact, I’ve converted to the laptop, Kindle, and iPad surprisingly well. I tend to FINISH books on weekends, mostly (I suspect) because I don’t have to stop reading and I just tear through until the end. So we do a lot of bookstore and library trips. I keep a running list of books I want to read pasted to my computer screen. And I do a lot of reading and editing for other writers, often on weekends when I have uninterrupted time. Around 1936, F. Scott Fitzgerald, the St. Paul-born author who wrote the American classic The Great Gatsby, penned a short piece called “Thank You for the Light,” which was rejected by editors at the time. The story is about a woman who steps into a Catholic church for a smoke break and, after she lights up, goes through a miraculous experience. Deemed a little strange by some readers, it may have been intended as part of a larger project. 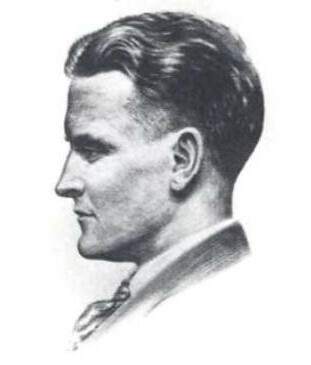 The story was finally accepted by the New Yorker when Fitzgerald’s grandchildren resubmitted it recently and is included in the August 6 issue. Fitzgerald’s Minnesota connection is well documented here: see A Guide to F. Scott Fitzgerald’s St. Paul and The St. Paul Stories of F. Scott Fitzgerald, for example. As for his more famous work, keep an eye out for The Great Gatsby film, set for release next summer. Diane Wilson, author of this year’s One Minneapolis One Read book, Spirit Car: Journey to a Dakota Past, and A Prairie Home Companion host Garrison Keillor are set to kick off the official discussion of this community read. The conversation will take place on September 24 at 7 p.m. at the Minneapolis Convention Center. Tickets are $10 but can be discounted to $5 for seniors and students. Other events will take place in the community throughout the week of September 19-24. One Minneapolis One Read was created to promote community involvement, literacy, and respectful public dialogue. It has been an effective way to bring the community together. One Minneapolis One Read joins forces with individuals, neighborhood groups, educators, businesses, and nonprofits to enhance the community positively. Join the fun! 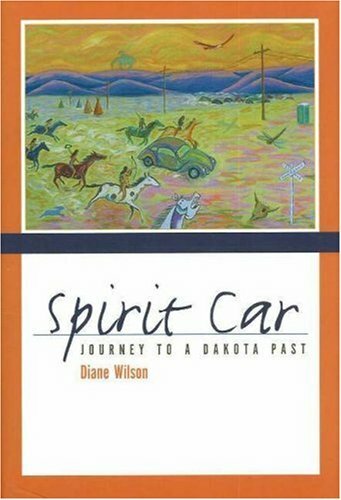 Both of Diane Wilson’s books, Spirit Car and Beloved Child, can be purchased through the Minnesota Historical Society Press or at local bookstores.